Our festival continues to build on the success of previous years offering food and drink from award winning local producers. We offer a wide range of locally produced foods showcased alongside foreign gastronomic delights, together with beer, wine and cider producers to titilate the tastebuds. With so much scrumptiousness available there is sure to be something to tempt even the most jaded palate. The 3 day festival will be supported by some of Kent’s finest musicians with the bandstand alive with different types of music. Enquiries have already been received for the 2019 event. 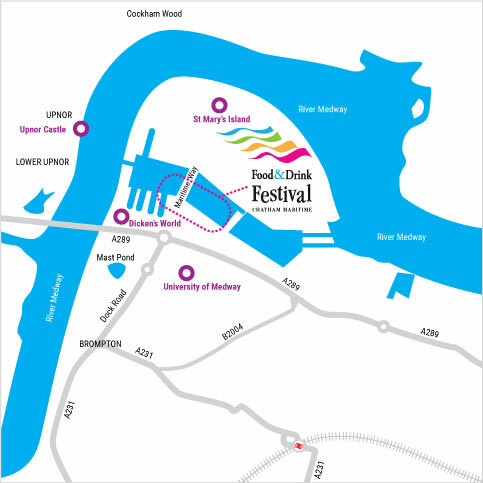 The festival is on the riverside at Chatham Maritime and will be clearly signposted. It’s free to attend and there is parking available. This page will be updated as details of the activities and timetable become available but for up to the minute information follow us on Twitter, Instagram and Facebook. To help you on the day please download the festival programme. We have fantastic music from local bands and a DJ throughout the festival. It’s Chatham Maritime, of course we’ve got loads of great water-based activities! This is the ‘flagship’ charity event for the Medway Sunlight Rotary Club and one that is a real highlight for the spectators and those involved. The Dragon boats are forty foot long, elaborately decorated Chinese war canoes with a dragon’s head and tail attached. You provide 16 ‘volunteers’ to paddle a boat plus a drummer to beat out the rhythm for everyone to paddle to (which everyone tends to ignore!). The Dragon Boat challenge for 2018 takes place at Basin 2 Chatham Maritime on Sunday 27th May. This is the fifth year that Medway Sunlight Rotary Club has organized this fun event and it looks like this year will be bigger and better than ever. Entry forms and all relevant information can be found on their Medway Sunlight Rotary website. All the teams that entered last year had a brilliant time and provided a fantastic spectacle for the thousands of spectators who thronged the side of Basin 2 to cheer on their favourite team as they enjoyed the wide range of food and drink available at the Food and Drink Festival. Take a look at Medway Sunlight Rotary Club’s video for the 2017 Dragon Boat Challenge. The festival is held on the riverside by basin 2 and the marina. The park and the dockside will be lined with food and drink stalls and the bandstand will host live music from local acts and a DJ throughout the festival. This year, there will be ample free festival parking at the Universities at Medway campus, a short walk to the event site. The route to the parking, and the walk from the car park to the festival site, will be clearly signed. Blue Badge holders will be able to use a designated car park next to the festival. Make sure you follow the correct signage to the car park you need. If you’re coming via satnav, use ME4 4TB and then follow signs to the event (or if you’re a Blue Badge holder use ME4 4QZ and then follow signage to Blue Badge parking). To avoid any confusion, turn off your satnav once you see the event signs. We’re asking festival goers not to park on St Mary’s Island, as it impacts on residents. And finally, just a reminder that Medway Council Enforcement Officers work over the festival weekend so unfortunately if you park illegally you do risk a parking ticket. Chatham maritime Trust run the festival every year using en event management company, The Event Umbrella, to organise and manage the stalls and entertainment. If you are a trader wishing to take space at the festival please register with The Event Umbrella. Your festival today was fun and going well, although very wet! That is until we kept our children out of the rain in the children’s tent. Brilliant! We went on all 3 days. Obviously a shame it rained on Monday but that is out of our control, Dragon Boat racing was fab, food and drink was awesome and music and atmosphere was brilliant. Same again next year please. Absolutely awesome day – down to the wire with the Dragon Boat racing – loved every minute. Thanks for a fantastic, well run event. Lots of really nice people & helpful staff. We’d love to do it all again. Great event & great weekend at Chatham Maritime Food & Drink Festival, well organised, well attended & lots of lovely people!